When Brahma manifested, millions of souls come out from his face followed by divine forces from Parabrahman. 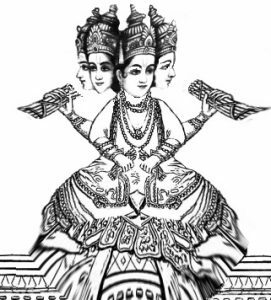 Lord Brahma reportedly emerged with four faces, each facing different directions. While the eyes were open in the frontal face, the eyes on the other three faces – sides and back –were shut4. Commencing creation, Lord Brahma converted seven souls of Deva Ganas into Hermits called Maharishis and activated life on earth. Since the hermits were deva ganas converted into human form they were able to shuttle between earth and heaven at will. Each of the million souls created were fixed with four life circles and put on a moving plane which till then lay invisible within the energies of Parabrahman. There are contradictions on the first batch of Hermits- Seven Rishies- created by Lord Brahma. The vedic school of thoughts, Jaiminia (The Jaiminia Upanishad Brahmana –जैमिनीय उपनिषद्-ब्राह्मण) mentions the list as Agastya, Atri, Bhardwaja, Gautam, Jamadagni, Vasistha and Vishvamitra, while another principle text called Brihadaranyaka Upanishad mentions same list but listing the seventh hermit as Bhrigu instead of Agasthya. Similarly the names of seven hermits vary in other principle texts of varying schools of thought. 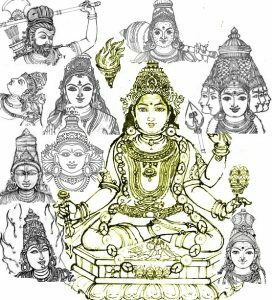 When divine energies of Parabrahman (Shivasakthi) took male and female form, Lord Brahma too converted the created souls into male and female combination in some ratio which is not clear to us. 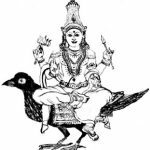 In order to establish male-female partnership and birth and death theory, Parabrahman and Lord Brahma released divines and souls with two different characteristics and features i.e male and female. One issue need to be clarified here. Though Lord Brahma was not authorised to release manifestations that would appear in land space below heaven, it was he who was authorised to establish Devaloga, Indra Loga and other heavenly abodes besides creating several Devas and Deva ganas to assist the principle and secondary divines created by Parabrahman. In order to message the ethics, morality and divinity besides canons of creation on earth, certain acts and manifestation of divines were needed and therefore the second primary lords were created from the energies of the first set of primary divines emerged from Parabrahman. 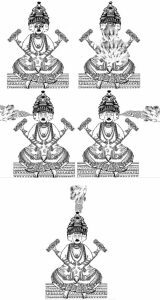 They included Lord Vinayaga who reportedly appeared with human head, Lord Devendra, Lord Yama followed by planetary lords like Moon, Sun, Rahu, Kethu, Budh, Guru, Sani besides Lords of Fire, Varuna, Vayu etc. The lords of fire, varuna and vaayu were primarily instrumental in pushing the humans into the path of belief on divinity by infusing fear with their fury5. 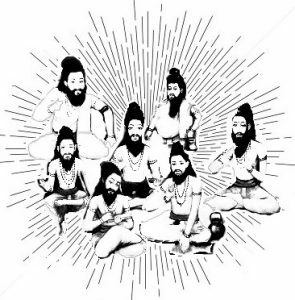 The seven hermits stood before Lord Brahma lifeless and confused not aware of their duties. Lord nominated them as his prime messengers and enlightened them with all aspects of life like four yugas, four different life circles for the souls, male-female combination, their partnership, children, ethics, norms in life, pious life, good and bad deeds, sins, need for divinity, the worship pattern etc in detail and directed that they spread the message to the humans on land. The above list is only indicative to make one understand the concept and theory of creation. The hermits were also impressed upon converting part of humans as divine messengers at some stage so that they could carry forward the preaching and teaching thereby articulating the Guru-Shishya relation. Lord Brahma also revealed the action plan for manifestation of several divine forces in different appearances in different periods of time and how the human souls would be under the control of the tutelary and family deities who would guide and guard them in Brahman’s drama on earth. At the end of sermon of Lord Brahma, the Maharishis got married with certain female souls created for them, entered into the land to accomplish their task which slowly gathered momentum. They entrenched in different parts of the land, created a task force in the form of disciples and moved around everywhere preaching divinity and worship amongst the the souls settled in various places in groups in the vast land of the plane. The first passion that was infused in their mind was fear followed by other ethics and norms to be followed. Infusion of fear was necessary to force them accept the invisible divines who were to manifest to guide and guard them as tutelary and family deities. After the universe was created and activities in the first phase called Yugas commenced, most of the humans lived in plain lands of serene atmosphere spread with flush green trees, mountains, flowing rivers etc. There were also divine forces in disguise in the form of Rishies, Munis, Sadhus and hermits to carry forward the messages of divinity and importance of worship. It is unknown to the scholars how the humans interacted with each other, their lifestyle, and the manner in which they worshipped divines. 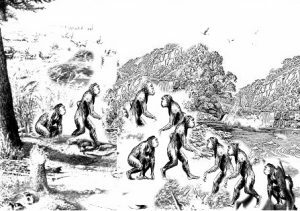 What was intriguing to the scholars and researchers on cosmic creation is ” When the historians rely on the Darwin theory of evolution to state that it was biological changes that caused the monkeys to turn humans, it perplexes one to note that in the first instance the cosmic was reportedly created with seven greatest Maharishis called Hermits like Bhrigu, Angiras, Atri, Vishwamitra, Kashyapa, Vasishta, and Bharathwaj. 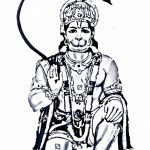 Their life history tinged with several stories on them revealed the highest order of wisdom and powers they possessed which have no parallel even to this date and they have displayed intriguing acts on various periods of time. Their sermons or acts can not have been absorbed by the race that existed in those periods of time unless they too were intelligent and capable enough to absorb them. The morale and discipline of the souls (humans) in the very first yuga would have been very high, lest they would not have been able to absorb their preaching and teachings on divinity. 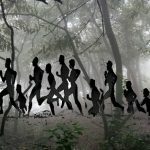 What is unclear is whether they had worshipped some form of divine or formless divines since it also remains disputed whether both the acts of Ramayana and Mahabharata took place in the first yuga or emerged later?’. No definite clues in any of the documentation is available to substantiate stories on yuga and all were mere belief accepted in faith and flowed down by word of mouth stories only. 5In each land where the groups of souls in the form of humans stayed, few divine forces manifested after enacting certain frightening and fearful dramas during nature’s fury as per the action plan of Lord Brahma. 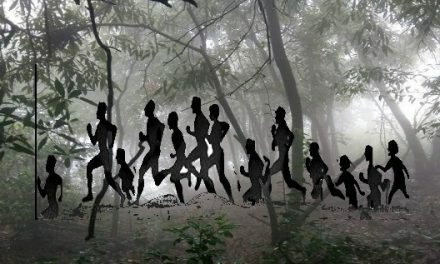 Those manifested were visible to some and invisible to others and divergent in nature such as flash lights, thunders, mysterious and fearful sounds, ghost images etc created panic in the minds of groups thereby forcing them to always stay near, or run in search of the unknown manifest to protect them. 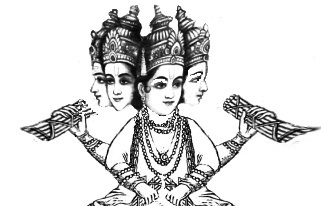 After emergence of the first phase called yuga the first sets of divines released by the prime divines manifested from the mystery flash lights, thunders, fearful sounds, ghost images etc in several areas to become group specific deities to specific groups of people as per the plan of action of Lord Brahma. Thus the foundation for the emergence of tutelary and family deities was laid. Each part of the land had unknown no of manifest in their area. The Maharishis with disciples in different forms decoded nature’s fury and mysterious images in such a way that the humans began to believe the invisible to be super natural powers divines who they told would guide and guard them. We do not have historic records to corroborate the events that took place and initially everything flowed down by word of mouth stories only. We need not further go deep in to the different episodes as it will be suffice to understand the concept of commencement of divine worship. After lakhs of souls were released from his face, Lord Brahma realized that at the end of 1,728,000 earthly years, as per his formulated plan, the life circle of the souls created by him for the first phase would end, and therefore he has to quickly act and create another plane ready to accommodate the souls who would move from the first phase. The souls floating in the phase needed to be moved over to the second phase in phases at appropriate stage i.e beginning of second and end of first phase. The mention of phase reflects Yuga. 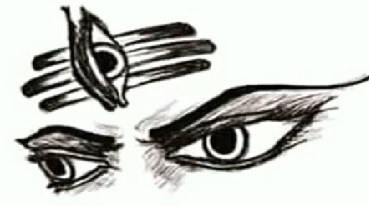 4In order to create a new plane, Lord Brahma closed the eyes in frontal face and opened the eyes of the second face. Instantly another plane which was invisible in the energies of Parabrahman became visible in that direction. After energizing the plane to automatically emerge at the end of the first phase to accommodate the moving souls from the first yuga for acts in it, he converted it into invisible one and began to create two more planes, one each in the other two directions by opening and closing his eyes of each face looking on those directions. Lord Brahma thus completed the creation of four phases called yugas and ensured that the souls would complete their life cycle in each phase and move over to subsequent planes to continue activities as per his plan of his action. Each phase called Yuga was allotted specific time frame, a definite purpose with yuga specific characteristic features which distinguished them from others and therefore to match with those characteristic, the characteristic of the souls too – diminishing morality – was set. More and more manifestations including tutelary and family deities became necessary in subsequent yugas since the souls would be slowly losing the purity and becoming impure with evil thoughts. 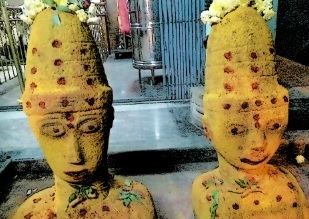 The humans in Satya yuga called ‘Yuga of truth’ were pure with divine in thoughts and acts and therefore not much divine forces were needed to guide and guard them, but with the dawn of subsequent yugas, more manifestation of divines were needed as the souls were to develop gross bodies and grow increasingly materialistic in thoughts and deeds by descending from purity into darkness. 2As said earlier, with the dawn of every yuga the manifestation of divine forces, especially the tutelary and family deities were on the raise and at the dawn of Kaliyuga, the last of the four yugas, the manifestation of divines forces were very high compared to divines manifested in the first three yugas. This is evident from the host of divines mentioned in Vedic scriptures, Ramayana and Mahabharata periods etc as the periods of Vedic, Ramayana and Mahabharata are only comparable in our known history. Why more and more manifestation of divine forces especially the tutelary and family deities were taking place in subsequent yugas ?. There were few plausible reasons. Few of the souls in pure mind in the first Yuga were slowly turning into souls of darker thoughts and they needed to be corrected back. 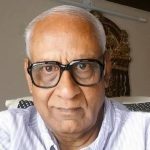 The entire souls released by the Lord in the first Yuga did not convert into humans and a part of them were still floated on the plane without a form waiting to take birth as human in subsequent Yugas thus altering the strength of souls from X quantum in first yuga to 2x, 3 x etc in subsequent yugas. Thus more divine elements may have been needed to guard and guide them. The area in terms of land in which the souls lived were limited in the first yuga and getting expanded in subsequent yugas. Reading the texts on epics, Puranas and other scriptures, it is evident that the concept of Tutelary and family deities began only from the period of Vedas when there were no castes or religions and everyone alike had worshipped the same form of divines. In the greatest epics like Ramayana and Mahabharata too there were no mention of religion, but only caste references- based on duties- were found supported by stories from cosmic creation in which it is stated that Lord Brahma released from his body four broad based divisions from his body and converted the souls into them which over the period of time have grown into castes with endless branches. Every branch had their own divines as family deity and thus more divine manifestation has taken place. What was the period in which the Vedas emerged ? Whether it was in first yuga or second yuga ? During the era of Rig-Veda people have worshipped nature in the form of divine. 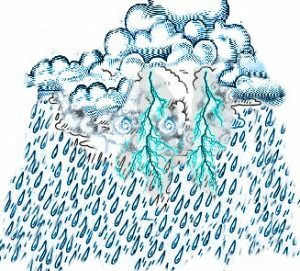 Based on the preaching of hermits in different places they have accepted that fire, rain, cyclones etc were released from some one invisible in the ethereal space and that they were much powerful than humans. Thus they may have commenced worship of those the formless invisible. The people used to gather in groups, pray the invisible to save them when the nature’s fury attacked them, and over period of time they began to regularly gather and worship those invisible in some place which became points of worship, which we now call as temples, shrines and by so many other names. The researchers have not been able to connect the forms of Lord Shiva, Lord Krishna, Lord Vishnu, Goddess Parvathi etc to the period of Rig-Veda. However they find some indirect references on them to prove that some form of image worship indeed prevailed then.